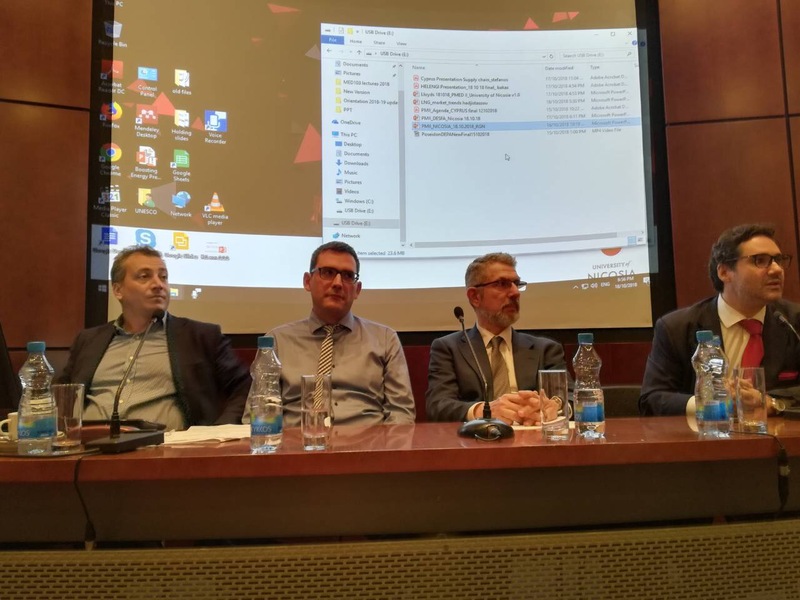 The achievements and milestones of the European co-funded project Poseidon Med II (PMII), was the main focus of the discussion on October 18th 2018, during an event that took place at the University of Nicosia. Participants represented the academic community; professors and students, PMII partners, as well as the EU co- funded project CYnergy. The event was officially opened by Dr. Theodoros Tsakiris, Director of Energy Studies atSchool of Business in University of Nicosia. Dr. Tsakiris at his introductory speech as Moderator of the first session stated that marine transportation could in fact move to a much cleaner fuel such as LNG. Ms Maria Fotiadou, Corporate Development Activities Division Head at DEPA S.A welcomed the audience and outlined PMII Project contribution to a cleaner environment, emphasizing on the role of LNG as marine fuel, for the transition to a new era with minimum environmental impact while at the same time facilitating the shipping industry’s compliance to the new emissions’ regulations. Mr. Stefanos Chonianakis, Associate in Corporate Development Activities Division of DEPA S.A, delivered the first presentation on what representsa holistic LNG supply chain and how this will be brought to life in the area of Eastern Mediterranean through the project’s activities. Mr. Joseph Florentin, PMII Project Manager & Business Development Department Manager of DESFA (Technical Coordinator of PMII), presented small scale LNG infrastructure at Revithoussa LNG Terminal and the conditions required for an efficient LNG bunkering scheme. First session was concluded with the presentation of Mr. Antonis Boutatis, Managing Director at ROGAN ASSOCIATES S.A. who talked about the value of investing in LNG infrastructure and the work in progress in the participating ports of the project. The second session was opened and moderated by Dr. Constantinos Hadjistassou, School of Engineering, UNIC who gave the audience an overview of the LNG market developments. The second session started by Mr. Ioannis Bakas, Technical Manager of HELENGI. Specific emphasis was given by him to the Clean and Green Shipping and especially to the innovative vessels’ designs and barges. Mr Bakas made conveyed two clear messages; that LNG bunker vessels designs are mature enough to materialize and that the retrofit of LNG designs of existing tonnage are already available and ready to be implemented. The second session was concluded by Ms. Anastasia Kouvertari, Project Manager for the EU co-funded project CYnergy on behalf of HELLENIC LLOYD’S S.A. Ms. Anastasia Kouvertari presented the Regulations for LNG Bunkering in Greece and specifically what is the regulatory status quo, as provided by the Presidential Decree for LNG Bunkering in Greece. A reference was made in Issues like Safety Zones, fire-fighting, training & competence and port and vessel manuals dealing with LNG Bunkering. The event came to an end with a Q&A session, which triggered a vivid discussion, especially on the commercial aspects of the LNG, its pricing and also issues relating to the training of personnel involved in the LNG bunkering supply chain and the active involvement of Ministries and competent Authorities especially at the implementation progress regarding the regulatory aspects of the Project.